One of Denmark's Best Locations...This unique property is superbly positioned between Denmark's famous Ocean Beach and Lights Beach and has Panoramic Awe-Inspiring Views rarely seen. Marvel at spectacular unrivalled water views of both the Great Southern Ocean and the Wilson Inlet plus the amazing limestone cliffs of the Nullaki Peninsula whilst nestled in a majestic 12 acre Karri forest. Unlike most holiday rentals there are no immediate neighbours thus ensuring complete privacy. This large spacious dwelling is perfect for family group holidays, a gathering of friends, international visitors or for romantic couples that wish to enjoy a quintessential Denmark experience.The property has a generously proportioned four bedroom solar passive house that overlooks playing fields with a private walk trail through the forest directly to the popular 'Monkey Rock' lookout and the iconic Bibbulmun Track. Coastal mountain bike tracks are just a short ride away. Birdwatchers and phtographers will know they have found a piece of paradise! The Denmark township is just an 8 minute drive away and the regions best swimming, surfing and fishing spots are at your doorstep. All of Denmark's attractions including the famous Williams Bay-Greens Pool area, fantastic wineries and scenic drives are very close by. Immerse yourself in the wonders of nature and feel like you are in a world of your own away from everyone and everything whilst still being just a quick drive to all of the towns amenities. Where else can you watch the surf breaking from your bed with whales breaching in the background, birds soaring above you and a majestic Karri forest as your backdrop! Did I catch you dreaming of your perfect getaway? ... here it is ... 'Nullaki Dreaming' ... come and enjoy! This fabulous two-storey house has Amazing Panoramic Views and can accommodate up to twelve guests.There are four seperate bedrooms - the Upper Level has two huge bedrooms with queen size beds and one with an extra single bed. There is a separate bunk room with two singles and another fold away bed if required. They adjoin a large light and airy living room with incredible views.The Lower Level has a private double bedroom plus a sofa bed if required and adjoins the cosy loungeroom with lovely views. The views from the main bedroom and the upper floor living rooms are simply sublime.There is good access from all rooms to the spacious upstairs bathroom which features a raised bath beside an expansive window that affords wonderful forest outlooks.Downstairs is another shower and toilet for the fourth bedroom or for after beach use. The north facing upper level living room captures all the morning sun naturally warming the whole area. The wrap around verandah has two large bench seats to soak in the wonderfull views and can be accessed by four sets of french doors. There is a slow combustion fireplace situated in the downstairs lounge room that heats the whole house.The laundry has a double sink, washing machine, cloths dryer, ironing board & iron and vacuum cleaner.There is under cover parking for two cars and plenty of room for more vehicles. All bed and bath linen is provided at no extra cost. Unfortunately we Do Not Allow pets to stay at the property. The private sanctuary teems with a multitude of small birds including the famous blue wrens as well as kingfishers, kookaburras, magpies, eagles, wild ducks and many varieties of parrots. Native wildflowers abound in spring and local kangaroos, possums and numbats visit the property regularly. Wake to a sunrise that bathes the expansive waterways in a warm hue. Surfers and fishermen can literally check the beach conditions from their beds. Throughout the day gaze over the treetops of the majestic Karri forest and ever green wetlands beyond to the magnificent inlet and ocean. In the afternoon relax with a beer or a glass of local wine on the spacious balconies to witness sunsets that highlight the splendour of the ever-changing colours of the rugged peninsula cliff faces, vast ocean and tranquil inlet. Where can you do this? ... at 'Nullaki Dreaming' that's where ... here it is ... waiting for you! - Panoramic views of ocean, inlet & Nullaki Peninsula. - Spacious and light filled. - Features a massive lounge suite & coffee table. - Large TV, stereo & games area. - Opens to wrap around balcony with two bench seats. - Chaise lounge suite & comfy chairs. - Views of ocean, inlet & forest. - Gas Oven & Hob and twin sink. - Brand New Large 520l Fridge. - Island bench & breakfast nook. 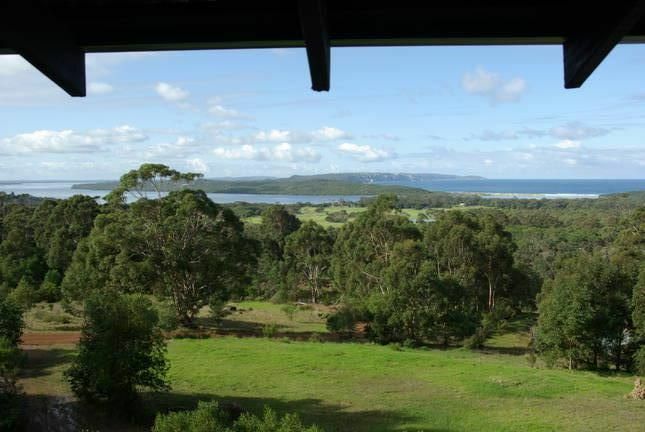 - Fantastic views of ocean, inlet and Nullaki Peninsula. - Opens to paved verandah & outdoor setting. - Access to an electric BBQ on the verandah. - Outdoor timber dining table. - Separate access from UF rooms. - Raised bath with forest views. - Separate shower & W/C. - There is a second GF shower & W/C. - 1 x queen bed. - Wardrobe, chest draws & side-tables. - Private access to vanity area, bath & toilet. - French doors open to balcony. - 1 x single bed. - Seperate access to bathroom & toilet. - Views of ocean & Karri forest. - Access to bathroom & toilet. - Views of Karri forest. - 1 x European double bed. - Wardrobe, draw & side-tables. - Access to the second shower & toilet. - Views of inlet & Karri forest. This exceptional two level house sleeps up to Twelve (12) guests. PLEASE NOTE: Tariffs are based on a TWO (2) person booking. EXTRA charges apply for each additional guest. A deposit is required to secure a booking with the balance due one month prior to occupancy. The deposit maybe forfeited if we are unable to replace a confirmed booking. The full payment will be forfeited if we are unable to replace the secured booking. Please refer to our Full Terms and Conditions under Online Bookings. A $250 Refundable Security Bond applies to each stay. The property is perfectly positioned between town, the beach and all of Denmark's attractions. Set in a tranquil 12 acre forest retreat and backing onto the Mt Hallowell forest reserve you feel like you are in a world of your own with the magnificent water views yet the township is a short drive away. Untouched beaches and coastline are at your door step for surfing, fishing or just exploring. You won't find a better location! The main bathroom is huge and services the three bedrooms on the upper level with a private separate access from the master bedroom. There is a raised bath with forest views, separate enclosed shower, seperate enclosed toilet and a vanity/dressing/makeup area. The lower level bathroom has a shower, separate enclosed toilet and services the fourth bedroom or for after beach use. It also incorporates a double sink, washer and dryer. The property is superbly located between Ocean and Lights beaches - Denmarks most popular beaches for surfing, fishing and kids. Surfers and Fisherman can literally view the ocean swells and beach from the bedrooms and verandahs of the house. Just a 5 min drive to Denmark's best beaches - Ocean Beach & Lights Beach. The most unique panoramic views of the Great Southern Ocean and the limestone cliffs of the Nullaki Peninsula - the property's namesake. Just a 5 min drive to Denmark's Best Surf Beaches - Ocean Beach & Lights Beach. The panoramic views of the Ocean also incorporate and expansive view of the Wilson Inlet that flows into the ocean at Ocean Beach. Large slow combustion enclosed wood fire with enclosed flu that traverses both levels to radiate heat. All linen and towels provided by professional commercial laundry company. Large slow combustion enclosed wood fire with wood provided. Plenty of parking for several vehicles. Under cover parking for two vehicles. Very Large Living/Family rooms and both levels - chais lounge suite, chairs, coffee table and wood fire on the GF level and ten seater wrap around lounge, chairs, coffee table and TV on the UF level. Huge well equiped kitchen with bay window and fanastic ocean and inlet views. Seperate breakfast nook and granite food preperation surfaces. Seperate enclosed full height pantry. Large separate Dining area off the Kitchen with eight seater table and another large and small table in the adjoining outside under cover area with fantastic water/forest views. Native garden with abundent bird attracting plants and playing field beyond. Huge upper level wrap around balcony accessed via french doors from the Bedrooms and Family room with Panoramic Views of the Ocean, Nullaki Peninsula, Wilson Inlet and Karri Forest. Ground floor patio adjoining the Kitchen and Dining room with fantastic Ocean, Inlet, Peninsula and Forest views. The property has a strong Eco-Tourist theme with a solar passive residence, rain water useage only, heating provided by local wood, indigenous flowering plants and retained natural vegetation & trees that compliment the exceptional location that affords awe inspiring views that are unique to this area of Denmark. Beautiful rammed earth home with some of the best views in Denmark. The property is very private and peaceful. The online photos don’t do it justice. So happy we found this gem, we will be back! Great location, great house, comfy beds would definitely recommend it to groups & families. Perfect place for our party of 12. The 2nd story was great for our families to bond and interact. There was almost no nternet access but it was great as the children and adults were not on their devices all the time. Magnificent setting nestled amongst the trees with incredible ocean views. We had a wonderful stay. It was a freezing cold, winter weekend, but the house was lovely & warm once we got the fire going. The beds were all really comfortable. We will definitely be back!! We were looking for the perfect wedding accommodation for family and friends and have found it in Nullaki Dreaming! Stunning views, beautiful setting in the forest yet close to town, the best beaches and wineries. Large living spaces with cosy nooks. This ticks all the boxes – we’ll be booking it for our wedding next year! Our second stay at this lovely place. Unbeatable views, space galore, and a well equipped kitchen for a large group. The price could perhaps be dropped slightly and there could be some more kitchen condiments stocked (salt and pepper, oil, etc. ), but otherwise this is an amazing place which we'll return to. The unique panoramic views from this solar passive house set in a 12 acre forest setting affords guests the opportunity to see many varieties of birds, wildlife and whale watching. The property is superbly located between Denmarks best beaches for surfing and fishing and the nearby 'Wison Inlet' for safe fresh water swimming and fishing. A walk track from the rear of the house joins onto the famous 'Bibbulum Track' and leads to the 'Monkey Rock' lookout. There is a coastal mountain bike track just a few minutes away and the regions famous wineries, scenic drives and the iconic 'Greens Pool' are just a short car ride away. The township is a ten minute drive for grocery shopping, service stations, library, doctors, hospital, coffee cafes, art & craft galaries, restaurents and boutique shops.